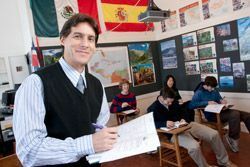 The study of World Language is an integral part of the Groton curriculum. By learning to speak a new tongue, Groton students open windows to other peoples and to other cultures. It is imperative in the present day that citizens of the world be able to communicate with each other; learning a language may offer one of the best paths to understanding another culture. Our curriculum offers students the skills needed to speak, read, write, and understand other languages, and enables students to be well-prepared for college courses or for opportunities to study abroad. Students learn skills needed to take tests such as the Advanced Placement examinations or SAT II: Subject Tests. Students must take one language through level 3 or continue through the Fifth Form, whichever comes later. Students taking a second World Language must continue through the second year of that language unless given special permission by the Department. Prerequisite: French AP Language. In this course students will continue their study of French literature. They will also read and study poetry, plays, short stories, or novels from the Francophone world. A unit might be devoted to the history and evolution of French cinema. Students will continue to be immersed in a French-speaking environment. They will work on developing their oral and analytical skills through discussion of literature, using a more sophisticated vocabulary. Students of advanced levels of French ( levels 5 and up) will be reading and analyzing novels, short stories and essays written by contemporain francophone authors from North Africa (Morocco, Lebanon, Algeria, Tunisia.) We will discuss the content of the reading and will put the events and ideas discussed in a historical and current events perspective. In this course students will delve into Spanish and Latin American literature through the reading of different authors as well as viewing films by different cinematographers. The purpose of the course is for the students to develop their conversational and analytical skills while acquiring more sophisticated vocabulary through the discussion of the course material. The course is open to students who have completed AP Spanish Language or with the permission of the instructor. All courses will be conducted in Spanish. Term courses might come from the following topics: Borges, Historical Fiction, and Esperpento; Historias sobre la historia; A survey of Spanish literature from Spain to the Americas; La ciudad y los perros; Mexico and its Ghosts; Cien Años de Soledad; Periodismo Narrativo. This course will take a look at issues that happen currently around the world. It is opened to advanced students of French (levels 5 and up). Students will read articles, prepare and lead discussion on a daily basis, Reading and discussion will be done in French. The group will be encouraged to write a blog for the school, in French, summarizing current events of the week. This course will take a look at issues that happen currently around the world. It is opened to advanced students of French, Spanish and Chinese (levels 5 and up) and native speakers. Students will read articles, prepare and lead discussion on a daily basis. Reading will be done in the language students are studying. Discussion will be done in English. The group will be encouraged to write a blog for the school, in the language they are studying, summarizing current events of the week. This course is an advanced course focusing on developing fluency in all areas of the language including reading, writing, listening, and speaking. It follows the AP Language curriculum and discusses various themes through current events, movies, literature, and other sources. Students present their work in creative skits, debates, and essays. Classes are conducted in French for an immersion experience Students signing up for this class as yearly commitment will be expected to take the AP Language and Culture examination. Any VI Former who chooses this course as a term elective will have it listed as Spanish 5 and may take it for one, two, or three terms. This course is an advanced paced course focusing on developing fluency in all areas of the language including reading, writing, listening, and speaking. Students present their work in creative skits, debates, and essays. In class, students continue to acquire vocabulary, review grammatical rules, and read representative literature. Students are immersed in Spanish-speaking cultures through literature, television programs, music, and presentations. Students will be expected to take the AP Language and Culturein May. Any VI Former who chooses this course as a term elective will have it listed as Spanish 5 and may take it for one, two, or three terms. Starting in the 2009-2010 school year, Groton School opened Mandarin Chinese language courses to students in all forms, in fulfillment of the world language requirement. This beginning course will lay the foundation for future Chinese language study. Speaking, listening, reading and writing/typing will all be components of the course. There will be an emphasis on pronunciation, especially the mastery of tones, on Hanyu Pinyin— Romanization system for Mandarin, and on radicals—the building blocks of Chinese characters. Students will learn to use practical vocabulary in class, related to greetings, family, dates and time, hobbies, and school life. Throughout the year, cultural elements and activities will be introduced. This course continues to develop listening, speaking, reading and writing skills in daily situations from the first year, with progress to an increased difficulty in grammar study and a broadening of vocabulary acquisition. Intensive oral drills will be complemented to fine-tune pronunciation and tones. Students will learn to use practical vocabulary in contexts of shopping, transportation, weather, dining, asking directions, and travel. Throughout the year, cultural elements and activities will be introduced. This course continues to develop listening, speaking, reading and writing skills in daily situations from the second year, with progress to an increased difficulty in grammar study and a broadening of vocabulary acquisition. Students will learn to use practical vocabulary and grammatical structures in contexts of doctor's visit, housing, sports, computer and Internet, and campus life. Throughout the year, cultural elements and activities will be introduced. This course continues to develop listening, speaking, reading and writing skills in daily situations, and begins to expose students to social issues in China; topics will include education, social changes, health and life, etc. Students will work on improving their language and analytical skills through class discussion, oral presentations, debate, and essay writing. This course prepares students for the AP Chinese and Culture Examination in May. Students continue to explore social issues in China from the previous year; topics include gender, environment, investment, etc. In addition, cultural topics—festivals, music, culinary culture, ancient philosophies, and so on— will be studied both in breadth and in depth. Students will be familiarized with the AP Exam format and will work on improving their language and analytical skills through class discussion, oral presentations, debate, and essay writing. Any Sixth Former who chooses this course as a term elective will have it listed as Chinese 5 and may take it for one, two, or three terms. This class lays the foundation for language study. Classes are conducted entirely in French in order to develop strong oral and aural skills. Students study the present, the passé composé, and the imperfect, as well as other grammatical structures Vocabulary is introduced in the text, in class, through short stories, and through visual aids. In the second year of French, there is an increased focus on grammar, verb form and usage, and vocabulary. Every verb tense is introduced for both regular and irregular verbs. Vocabulary expansion is a priority. Classes are conducted entirely in French to encourage students' oral and aural skills. Cultural conversations, small skits, and oral drills are designed to encourage students to speak French as much as possible. Vocabulary is introduced in the text, in class, through short stories, simple poems, and through visual aids. This course offers a total review of grammatical structures including the subjunctive mood. It emphasizes speaking and writing, as well as vocabulary development. Oral skills are stressed, including pronunciation, conversation, and dramatic presentations. Students prepare for the Barrier Examination, which is the June final examination. Current texts include Breaking the French Barrier, Level III, Astérix et le Tour de Gaule, and Le Petit Prince. This course includes the reading of short stories, plays, and a novel, by Ahmadou Kourouma, Matthieu Delaporte, Alexandre de La Patellière, Yasmina Reza, Fouad Laroui, as well as the review of current events through newspaper articles and television broadcasts. Teachers will make use of situational vocabulary, oral presentations, essay writing, reading comprehension practice, and a thorough review of complex grammatical structure when needed, with an emphasis on making vocabulary and grammar practical both orally and in writing. This course lays the foundation for language study. Students learn three tenses: present, preterite, and imperfect. They learn many practical vocabulary words related to families, houses, school, food, and transportation. Writing, speaking, listening, and reading are all components of this course. Classes are conducted in Spanish, and students have numerous opportunities to speak. The current text is Breaking the Spanish Barrier, Level I. Throughout the year, students read short chapter books and periodically watch video programs. In the second year, students expand their grammatical foundation. The present perfect, pluperfect, future, conditional, future perfect, and conditional perfect are considered. In addition, the subjunctive mood is presented, including the present perfect subjunctive, as well as formal and familiar commands. Vocabulary expansion is a priority. Students give oral presentations, participate in skits, listen to dialogues and songs, and speak and write extensively. They also read an exciting series of short fiction. The current text is Breaking the Spanish Barrier, Level II. This year is the final intense year of grammatical study. The subjunctive mood is studied in great depth, including the imperfect subjunctive. Intensive review and amplification of grammar, vocabulary, and sentence structure occur throughout the year. The current text is: Breaking the Spanish Barrier, Level III. Students also read collections of short stories and articles from the Internet, which they discuss in class. Short videos and movies are viewed periodically for cultural content. The focus of this course is on improving language skills, written and oral—vocabulary, grammar review, reading, and conversation. A student will do periodic reviews of important grammar and will make frequent presentations in class. Speaking and listening skills are especially emphasized. Thematic units include travel, high-tech, food, animals, music, and sports. Films and television documentaries are viewed periodically. In this course students will delve into Spanish and Latin American literature through the reading of different authors as well as viewing films by different cinematographers. The purpose of the course is for the students to develop their conversational and analytical skills while acquiring more sophisticated vocabulary through the discussion of the course material. The course is open to students who have completed AP Spanish Language. All courses will be conducted in Spanish. Term courses might come from the following topics: Borges, Historical Fiction, and Esperpento; Historias sobre la historia; A survey of Spanish literature from Spain to the Americas; La ciudad y los perros; Mexico and its Ghosts; Cien Años de Soledad; Periodismo Narrativo. Rebecca Stanton, the chair of Groton’s Modern Language Department, holds a BA from Universite Rene Descartes, and LLM degrees from Universite Pantheon Sorbonne and Boston University. After graduating from BU with a specialty in tax law, she worked for a lawyer in Boston, then turned her energies toward teaching. She joined Groton’s faculty in 1993. Besides teaching French, Rebecca recently created an Arabic elective for seniors, which she co-taught. In 2009, she was awarded the Breck Award , which recognizes excellence in teaching. Rebecca is faculty advisor to the Jewish community, French club, Spanish club, International Community Advising Program, and a judge for the Groton Debate Society. She also works part-time in the Admission Office. Rebecca and her husband, Gary, have two children, Emilie ’09, who attends Boston University, and Alexandre, who attends the International School of Boston. When time allows, Rebecca can be found with a good book, a glass of wine, and a map of the next country she plans to visit. 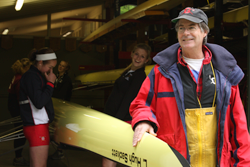 Assistant Head of School Andy Anderson arrived at Groton in the spring of 1980 to coach rowing. After returning to the consulting world for six months, he came back to the Circle in January of 1981 to teach English and work in the Admission Office. After ten years in that capacity, he switched to teaching Spanish full time, a move that was possible because he grew up in Latin America and Spain. For the past twenty years he has taught Spanish and currently teaches Spanish 3. Coaching rowing is a passion for Andy, who has coached national champions on the club, college, and high school level, including the Groton girls in 1995. For many years, Andy was a coach for the U.S. National team in rowing; his boats won three gold medals at the World Championships. At Groton, he is the director of rowing and coaches the boys varsity boats. He writes a monthly column for Rowing magazine and has published a book, The Compleat Dr. Rowing. Andy holds Groton's Dillon Chair of the Humanities. He lives in the Richards House with his wife, Cola Parker, and his children, Willy ’15, Ella ’17, and Lucy ’20. John Conner, affectionately known throughout the Groton community as "Señor," arrived at Groton School in 1981. A graduate of Amherst College, John received his MA in Spanish Language and Linguistics from the University of Wisconsin a few years after a backpacking adventure throughout Europe, where he fell in love with Spain, its language, people, and culture. John’s textbook series, Breaking the Barrier (Breaking the Spanish Barrier and Breaking the French Barrier) reflects his creativity, tongue-in-cheek fascination with pop culture, and belief that all students can succeed in languages. Breaking the Barrier shines an unapologetic light on the importance of grammar in mastering a foreign language. According to Señor, "When you have a good foundation in grammar, you can go places you've never been before!" He is a frequent speaker at language conferences throughout the world. Breaking the Barrier was the first series showcased on Apple's iTextbook store. 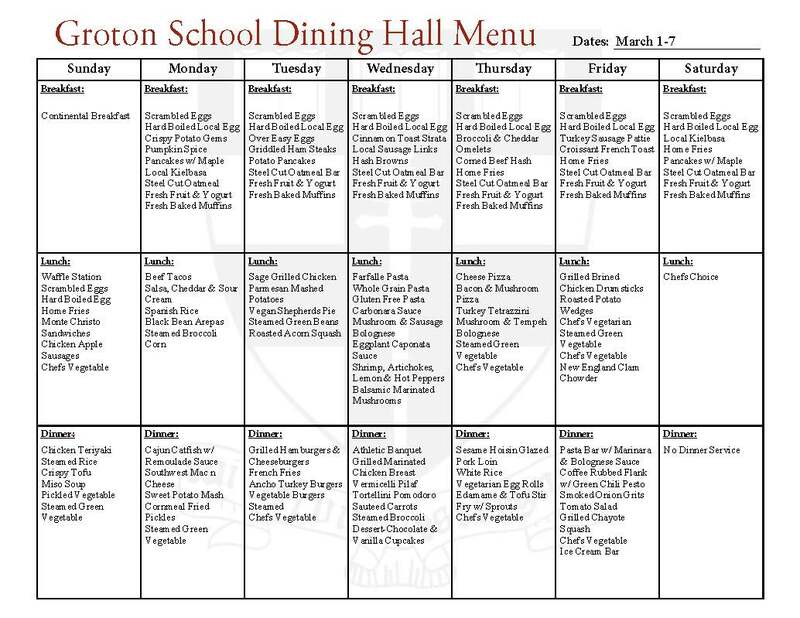 At Groton School, Señor Conner is also dean of faculty; he is the current recipient of the E. Roland Harriman Chair. He also coaches boys varsity tennis, a perennial powerhouse in the ISL; the squad won the league in 2018 with a 15–0 record. Señor Conner has four children, Jamie ’11, Hannah ’14, Alexandra ’16, and Sarah ’19. Before joining Groton School, Franck taught French at the French Library in Boston, at Clark University, and at Suffolk University. He received a Maîtrise (BA) de Lettres modernes and DEA (MA) de Littératures française, francophones et comparée at Université Michel de Montaigne Bordeaux 3, and a master's in communications and advertising from INSEEC-Paris. Among his many interests are basketball, soccer, news, and politics, and how news and politics interact and are perceived in our modern societies.